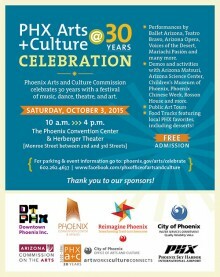 The Heard Museum is proud to join several other Phoenix arts organizations in marking the 30th anniversary of the Phoenix Arts and Culture Commission at a special celebration Saturday, Oct. 3, downtown at the Herberger Theater, Phoenix Convention Center and along Monroe Street between Second and Third streets. 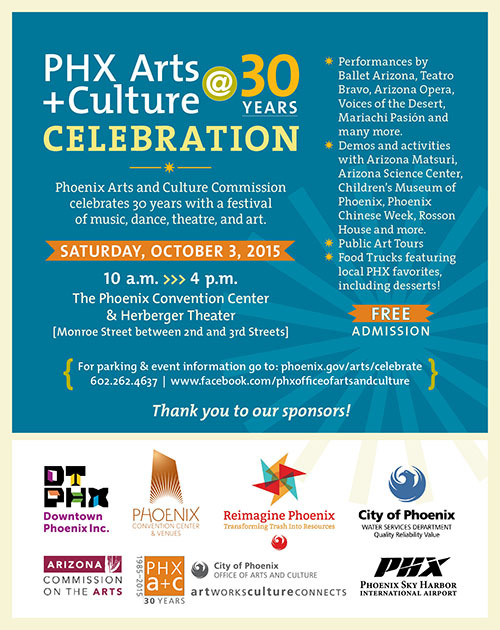 Find the Heard Museum’s table with hands-on art activity from 10 a.m. to 4 p.m. on the plaza in front of the Herberger Theater, 222 E. Monroe St. Several other activities and artist demonstrations will also take place at those times at tables staffed by representatives of many area arts organizations. Here’s a complete schedule of events and a timeline of the 30th anniversary celebration. The Heard extends grateful appreciation to the Phoenix Arts and Culture Commission for its many years of support of the museum. In addition, the Heard will host a table with children’s art activities at the Roosevelt Row Chile Pepper Festival, 4 to 11 p.m. Saturday, Sept. 26, at 721 N. Central Ave., Phoenix. Get festival information and tasting tickets here.